Driving through DeKalb County, farms are a constant part of the landscape. 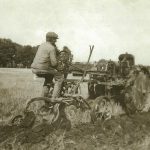 However, farming itself has experienced many changes over the past hundred years. As part of the DeKalb County History Center’s upcoming exhibit “Crossroads: Change in Rural America” the February Brown Bag/Local Lore lunch program will explore the stories connected to local Centennial Farms. The contributions of DeKalb County’s farming families have withstood the pressures of growth, changes in farming methods, drought, floods, and economic challenges to preserve these important pieces of our region’s commercial and cultural history. Bill Lenschow and Glen Bolander will share their stories of how their family farms have adjusted to these changes over the last hundred plus years. This discussion will continue after the February 7th Brown Bag Lunch/Local Lore presentation at two additional locations on February 20 at the Kirkland Historical Society and on February 25 at the Sandwich Public Library with long-time farming families from the north and south part of the county sharing their stories. The Brown Bag/Local Lore programs are presented in partnership by Ellwood House Museum and DeKalb County History Center and are held on the first Thursday of the month. The program is free and open to the public, but donations are appreciated. Refreshments will be served. For more information visit dekalbcountyhistory.org or call 815-895-5762. Photo: Bill Lenschow will be sharing his family’s history, including information on his grandfather William Lenschow.